a series of meetings last week between government officials and the editorial board of the Telegraph-Journal. Several stories came out of these meetings, one of which concerns UNB in particular: “Money main factor in centre location, Keir says,” Quentin Casey, Telegraph-Journal (June 26/09). 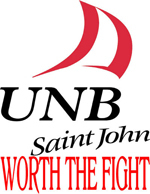 Passing over the Minister’s shaky grasp of history — the fear of the Saint John campus being closed “was absolutely, positively the farthest thing from the truth”? — and his lacklustre defense of the integrity of either campus — he said he’d “love to” “pick up the Grandview Avenue community college and plunk it out there” at Tucker Park — he does seem fairly clear that even though the reason is mainly budgetary, wholesale co-location of NBCCSJ and UNBSJ is not going to happen. And let’s all hope the T-J finds something else on which to focus.